From Middle English dyamaunt, from Old French diamant, from Late Latin diamas, from Latin adamas, from Ancient Greek ἀδάμας (adámas, “diamond”). (uncountable) A glimmering glass-like mineral that is an allotrope of carbon in which each atom is surrounded by four others in the form of a tetrahedron. The saw is coated with diamond. A gemstone made from this mineral. The dozen loose diamonds sparkled in the light. 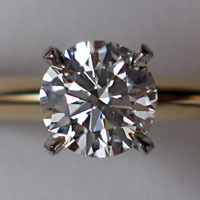 A ring containing a diamond. What a beautiful engagement diamond. A very pale blue color/colour. Something that resembles a diamond. (geometry) A rhombus, especially when oriented so that its longer axis is vertical. (geometry) The polyiamond made up of two triangles. (baseball) The entire field of play used in the game. (baseball) The infield of a baseball field. The teams met on the diamond. (card games) A card of the diamonds suit. I have only one diamond in my hand. (printing, uncountable, dated) A size of type, standardised as 4½ point. Terms derived from the noun "diamond"
made of, or containing diamond, a diamond or diamonds. He gave her diamond earrings. of, relating to, or being a sixtieth anniversary. Today is their diamond wedding anniversary. of, relating to, or being a seventy-fifth anniversary. Borrowed from Dutch diamant, used by Dirck Voskens who first cut it around 1700, presumably naming it by analogy with the larger Perl. (printing, dated) The size of type between brilliant and pearl, standardized as 4½-point. “Diamond” in David Barthelmy, Webmineral Mineralogy Database , 1997–. “diamond”, in Mindat.org ‎, Hudson Institute of Mineralogy, accessed 29 August 2016.